If you�re looking for the perfect getaway plan, this could be it. 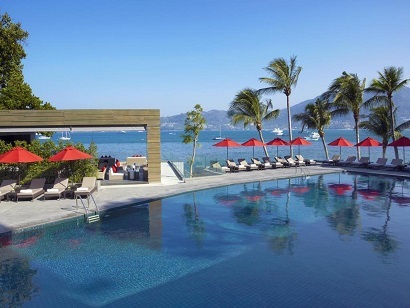 Located at the quiet end of Patong, Phuket�s most popular beach, the Amari Phuket boasts numerous amenities beyond their comfortable rooms and extreme dedication to customer satisfaction. Guests will surely enjoy the Breeze Spa, two swimming pools, and fitness area. A renowned Italian restaurant overlooks the bay, making it a perfect location for those seeking a romantic mood. Also located on-site is a professional diving center offering PADI scuba diving trips for guests of all skill levels. The bay is also home to many species of colorful fish for those who simply want to snorkel off the beach. 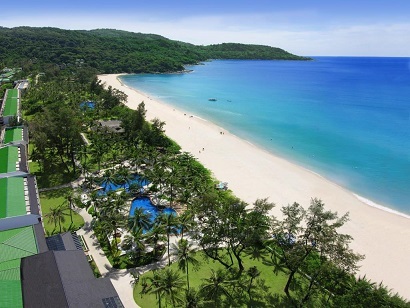 Amari Phuket lets you enjoy the best of Phuket with excellent amenities and location. The international deluxe resort in a contemporary low-rise is located on the quiet corner of north Patong-Kalim Bay in Phuket. It is comprised of 121 well-appointed rooms and suites which are 53sqm in size and above. Each room has a private balcony with a coffee table and two chairs as well as full in-room amenities and facilities with a complimentary tea/coffee maker and two bottles of drinking water. To ease your nerves and relax your body, a large free-form swimming pool with a swim-up bar and Jacuzzi pool can be enjoy. There is also a fitness center with a sauna if a workout is how you unwind. There is also an internet caf� and a library, activities room, tour counter and taxi counter, money exchange, and shuttle bus to the nearby shopping center. 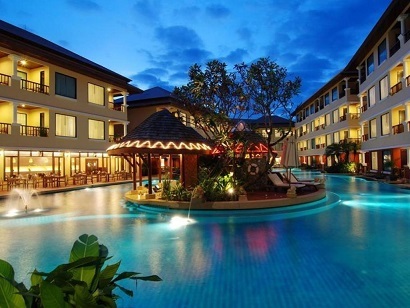 All things considered, Patong Paragon Resort & Spa is excellently located, well appointed, and reasonably priced. 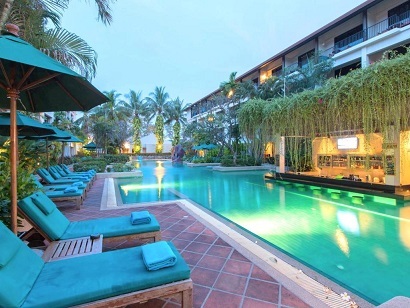 Situated just minutes from Karon Beach and all of its adjoining bars, restaurants, and other assorted nightlife locations, this resort offers the complete Phuket experience. There are three pools on the premises for those who don�t care for sand and the crowds. 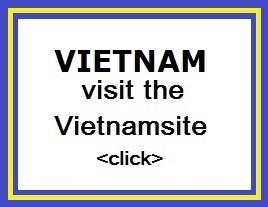 The staff is extremely helpful and courteous and hosts a poolside barbecue each night. Beautiful views, water sports, and quality beach time are just a few of the ways to spend your time while at the Best Western Phuket Ocean Resort. Making a booking at Best Western Phuket Ocean Resort is easy with our secure online form, just enter your dates and click. Located right on Karon Beach, Woraburi Phuket Resort & Spa offers 207 rooms housed in three low-rise building designed in the architectural style of southern Thailand. All rooms are blessed with their own private balconies while 34 Cabana rooms have their own pool access. A large, infinity-edged swimming pool makes for a glorious centerpiece strategically located in the heart of the resort so that all rooms have prime views of the landscaped garden. The resort is a 5-minute drive to the famous Patong beach and a free shuttle service is provided to the area. A local shopping market is also conveniently located within walking distance. To make your reservation at Woraburi Phuket Resort & Spa, please proceed to our secure online booking form. Set away from the heavy tourist areas, Katathani Phuket Beach Resort is located in the secluded Kata Noi Bay on 850 meters of private beach. You can select to stay in the room, suites, or the two-bedroom villas. There are six nature inspired swimming pools and six restaurants which offer beach views to gourmet dining experiences. There are water sports for the active vacationers and indoor games and spa facilities for those on a relaxing holiday. A golf outing to any of the world-class golf courses, parasailing, and island excursions can be arranged via the tour desk. You can enjoy the markets of Phuket Town without ever leaving the resort with Katathani organizing their own private night market on-site. The resort provides everything that makes for a perfect holiday so you can do as much or as little as you like. 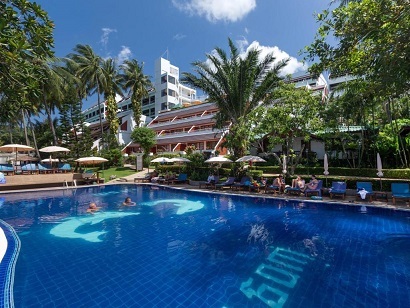 Katathani Phuket Beach Resort is easy to book - just enter your travel dates on our secure online booking form. In central Patong, Banthai Beach Resort & Spa is located next to white sands and a thriving local community. Set on five acres of landscaped grounds, the contemporary Thai styling is mixed with an emphasis on modern comfort in a peaceful setting. Subtly different, this resort's clean architectural line focuses on maximizing space and creating an ambiance of tranquility. While its central location ensures convenient access to all facilities in Patong, the resort's calm interior blends harmoniously with nature and the outdoors. This property offers 217 rooms in contemporary Thai design and architecture with full amenities and facilities including two free-form swimming pools for the complete holiday experience. This resort is an absolute retreat with a secluded atmosphere of tranquility, convenience, and an idyllic setting in the heart of magnificent Patong Beach.